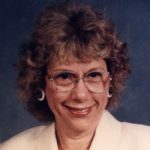 Diane R. Smith, of Cape Coral, Florida passed away peacefully at her home on December 31, 2018 at 83 years of age. Born March 6, 1935 in Philadelphia, Pennsylvania to the late Elwood J. and Viola Chrone Fickenscher, she loved the outdoors, South Jersey beaches, and enjoyed figure skating and horseback riding through Fairmount Park in Philadelphia. She graduated from the Philadelphia College of the Bible and married David Edward Smith. She was active for many years as Admissions Coordinator for St. Christopher’s Hospital for Children. In later years, she enjoyed her work as a vacation rental specialist at Hatteras Island, NC. She loved beach living and her work at the Cape Hatteras Baptist Church as Deaconess and Puppet Ministry Leader. She was loved by many for her cheery spirit and her love of serving others. She will be dearly missed by her daughter, Wendy S. Price (son in law, Carroll Price), son, David W. Smith as well as granddaughters, Jennifer Price Marseille (husband Jean G. Marseille) and Bethany Joy Price; and 4 great granddaughters, Ariella Marseille, Ilana Marsielle, Gabrielle Marseille and Elise Marseille; sister in law, Jan Furr, nieces, Susan Davy, Sharon Bach, and nephew Steve Ritchie. She was preceded in death by her husband, and true love, David Edward Smith. Visitation will be held on Thursday, January 3, 2019 from 3 p.m. to 4 p.m. at the Fuller Metz Funeral Chapel in Cape Coral. The prayer service will be held in the chapel at 4 p.m., officiated by Pastor Kevin of the New Hope Baptist Church. Interment is planned for Monday, January 7 at 1 p.m. in Richland Cemetery, Richland Township, PA.
Special thanks are given to Lee County EMS/Fire and Cape Coral Police Department for their professionalism and caring attitude. In Lieu of flowers, Memorial donations may be made per the family’s request to the Harry Chapin Food Bank 3760 Fowler St, Fort Myers, FL 33901.